The fourth edition of the popular >Advanced Fitness Assessment and Exercise Prescription> now comes packaged with a supplemental online course, >Cardiorespiratory Fitness Assessment and Prescription.> The course works in tandem with the text to bridge the gap between research and practice, providing a comprehensive and advanced approach to physical fitness testing and exercise prescription.The online course component will help your students test and assess cardiorespiratory fitness in normal adults and design exercise programs to match their individual requirements and abilities. Students will assume the role of a newly hired fitness center trainer and will interact with six virtual clients in real-life situations as they move through a series of situations and exercises. A brief quiz will complete each daily session.The text provides all the information necessary to work through the course and to build a solid foundation in fitness assessment and exercise prescription. Using a direct, clear-cut approach, renowned exercise physiologist Vivian Heyward, PhD, shows students and professionals how to select physical fitness tests, conduct physiological assessments, and design individualized exercise programs and prescriptions.The text integrates important principles and theories in exercise physiology, kinesiology, nutrition, psychology, and measurement, and then applies them to physical fitness testing and individualized exercise program design. The end result is a practical guide-complete with internationally relevant examples-that will help practitioners develop their knowledge and skill as exercise science and fitness professionals.The updated text, which contains the latest information from the sixth edition of >ACSM's Guidelines for Exercise Testing & Prescription,> is unique in its scope and depth of its content, organization, and approach. Among its features are--pedagogical aids such as chapter-specific key points and terms, review questions, and a complete glossary to help readers identify and define important terms and concepts;-extensive appendixes that include over 15 reproducible forms to help readers systematically and thoroughly assess clients or track their activities and progress;-more than 25 easy-to-follow charts and tables showing both norms and standards and the most popular test protocols;-a clear and convenient guide for administering tests and prescribing exercise;-ready-to-use client handouts that describe or illustrate 90 exercises for strength, flexibility, and low back care, including handouts for exercise dos and don'ts to help clients exercise safely; and-an electronic instructor guide that provides sample course outlines, class projects, laboratory experiences for each fitness component, case studies, and sample problems and solutions.Additionally, chapter-by-chapter revisions give readers the background they need to update their knowledge, skill, and professional competence as exercise scientists. The revisions include--recent global and U.S. statistics on the prevalence of various chronic diseases,-new research substantiating the link between physical activity and disease risk,-psychological theories related to behavior change and the application of these theories to exercise program adherence,-use of the VO2 reserve method for prescribing intensity of aerobic exercise,-alternative modes of aerobic exercise,-an extensive list of dynamic resistance training exercises with variations for specific muscle groups,-new approaches to and exercises for low back care, and-Web sites for professional organizations and equipment manufacturers.The substantially updated >Advanced Fitness Assessment and Exercise Prescription, Fourth Edition,> is an essential text for students and professionals of exercise science. 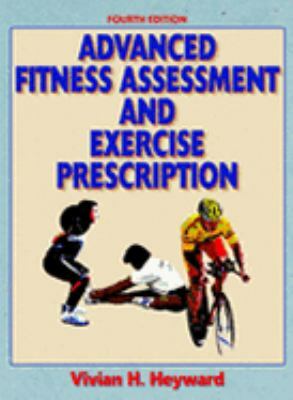 Additions and revisions to the text, as well as the accompanying online course >Cardiorespiratory Fitness Assessment and Prescription,> mHeyward, Vivian is the author of 'Advanced Fitness Assessment & Exercise Prescription' with ISBN 9780736062251 and ISBN 0736062254. Loading marketplace prices 5 copies from $1.08 How does the rental process work?